The Likely Suspects: Here we are at yet another short track. Richmond is a tad more predictable than Bristol, so stick to the proven elite drivers this week and you should do well. Look for these drivers to score you some solid points this weekend: Joey Logano, Carl Edwards, Kyle Busch, Jimmie Johnson, Kevin Harvick, Ryan Newman and Jamie McMurray. My 2 Cents: Starting position is very important at Richmond. If you get stuck on your picks, think open wheel experience. Drivers who have open wheel experience tend to do better on short tracks. My no-brainer pick this week is Joey Logano, followed by Kyle Busch. My next picks are: Carl Edwards, Ryan Newman, Clint Bowyer and Jamie McMurray. I will round out my team with Chase Elliott and Brian Vickers. My Final Four: Joey Logano, Ryan Newman, Carl Edwards and Chase Elliott. Petty Enterprises has the most wins at Richmond in the NASCAR Sprint Cup Series with 15; followed by Hendrick Motorsports, Joe Gibbs Racing with 10 each and Richard Childress Racing with nine. Although eight Sprint Cup drivers have posted consecutive wins at Richmond International Raceway, Jimmie Johnson (2007 sweep) is the only active driver in this category. Kyle Busch leads all active drivers in theSprint Cup Series in average finishing position at RIR with a 7.095. Brad Keselowski leads all active Cup drivers in average starting position at RIR with an 8.769. 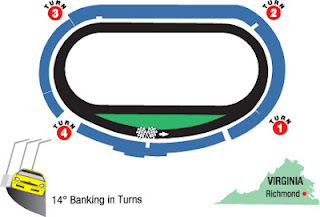 More than three-quarters (93 of 119) of the Sprint Cup races at Richmond International Raceway have been won from a top-10 starting position.